From Earth To Plate: Coconut Vitality Restore Smoothie! Revive & Rebuild. There is no better way to start your day then with a complete meal that's is packed with an abundant array of nutrients. This smoothie is packed with Antioxidants, Magnesium, Potassium, B Vitamins, Iron, Vitamin C, Proteins, Amino Acids, Calcium, Plant Sterols & gives the body a huge hydration hit after being asleep for many hours. This smoothie is also great to have after exercise as the high amounts of Magnesium & Protein help restore the nervous system, rebuild muscle tissue, & the Coconut water hydrates the body. Chop up your banana into about 5 sections. Add into blender along with blueberries. 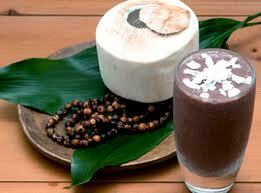 Add in all of your powders & steadily pour in your coconut water. Place cover on blender & blend for 1min or until smooth. Pore into your glass & enjoy the invigoration.